Traditionally, when someone speaks about a ‘shopping mall’, people tend to imagine a complex of stores representing merchandisers with interconnecting walkways that enable customers to walk from one shop to another. Now, when consumers visit shopping malls, they are looking for experiences that go well beyond traditional shopping. To survive in a digital age, malls will need to reinvent themselves and leverage mobile and location technology. According to the US Department of Commerce, sales have declined by 31,2% from 2005 to 2015. In the face of these considerable challenges, in which everybody is able to make purchases easily from a mobile device, shopping malls need to stay relevant, drive growth and boost efficiency. Step by step, Shopping malls owners and managers have moved into the mobile space. Being aware of the benefits of mobile marketing, they have developed their own mobile apps in order to fulfill customer experience while shopping. Moreover, by leveraging mobile and location technology, the shopping mall apps are able to understand the behavior of visitors at malls, enhance their experience, and drive footfall to retailers. 75% of top 20 U.S. retailers have implemented proximity technologies while businesses increased operating profit by 8% with ROI of 365%, according to the latest report from Proxbook. 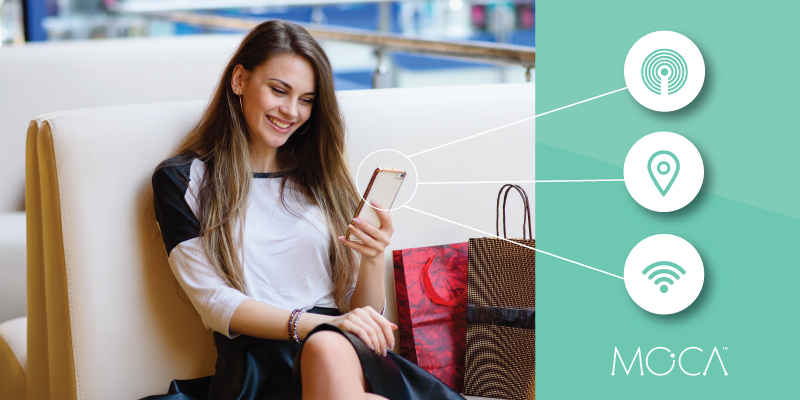 Geofencing, Bluetooth beacons, and Wi-Fi proximity are technologies that enable shopping malls to gain customer location and deliver personalized notifications, making the shopping experience more personal. Proximity technology provides shopping mall owners and managers information on how many users prefer certain stores, how long did they stay at the shopping center, at what time do they purchase or what are their interests in specific events. Using information based on customer preferences combined with location targeting, enable landlords to send relevant messages in real time to their customers. For instance, the shopping mall app can send special offers about restaurants or cinemas settled down at the same shopping center. However, frequency capping is vital to ensure customers are not exposed to numerous notifications while they stay in the shopping mall. Moreover, using indoor location services, customers can be helped when they look for a parking place in a shopping mall. As soon as a shopper enters in a range area, the mall app can trigger a notification informing about the number of parking places available. It also can help shoppers to find the best route to go a specific place. Around the world, there are many shopping centers that are using beacons, geofencing and Wi-Fi technologies to enhance the customer experience but we have selected three of them. According to Proxbook Report, Majid Al Futtaim group is located in the United Arab Emirates and its main objective was to understand the behavior of visitors at malls, enhance customer experience, develop a central mechanism to engage visitors with consistent branding and services across 15 of their properties, and drive footfall to retailers. Majid-Al-Futtaim Group was able to unlock actionable insights into individual visitor behavior such as frequency of visits, dwell time, where visitors spend their time, the impact of campaigns, variations in customer behavior across malls, etc. After eight months of implementing the location-based solution, they deliver more than 60 million engagement messages and get 10 times better engagement rates compared to social media campaigns. Simon Property Group is the largest shopping mall operator in America. It has installed about 4,800 beacons across 192 malls and shopping centers nationwide and not only does it hope mall shoppers will welcome messages sent through the Simon App, but it also sees the beacons as a service for existing retailers in the mall who can integrate their apps and message shoppers through it as well. The mall operator is betting that customers who have downloaded the Simon app will welcome messages sent to their smartphones when they walk into the mall, especially if they reward them with loyalty points automatically for just visiting, or send them information on the latest trends at their favorite shop. 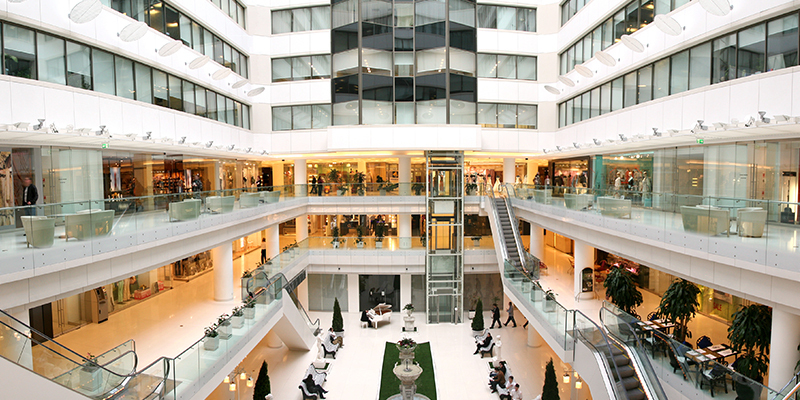 Hammerson is an owner, manager, and developer of retail destinations in Europe. The company has spread out Bluetooth beacons across their entire shopping center portfolio, to work in conjunction with their mobile app, Plus, which was initially trialed at Les Terrasses du Port in Marseille, Paris. Using information based on customer preferences, combined with geo-technology to determine a shopper’s location, Plus app sends real-time personalized content in specific locations at the center. The future of retail is becoming more focused on the personalized customer experience. Using shopper location insights along with engaging messages, shopping malls can influence customer behavior, increase brand loyalty and lead more sales. By differentiating the consumer offering, the success is guaranteed and location marketing will light the way.